With their brilliant orange color, pleasingly moist texture, and delightful pumpkin flavor, these baked (not fried) doughnuts are the perfect on-the-go breakfast for a crisp autumn day. Baking gluten-free? For great results, substitute King Arthur Gluten-Free Measure for Measure Flour for the all-purpose flour in this recipe; and increase the baking time to 20 minutes. *See "tips," below, for a lower-sugar option. **See tips, below, to substitute King Arthur Unbleached Self-Rising Flour. Fill the wells of the doughnut pans about 3/4 full; use a scant 1/4 cup of batter in each well. If you're making muffins, fill each well about 3/4 full; the recipe makes about 15, so you'll need to bake in two batches (unless you have two muffin pans). While the doughnuts are still warm (but no longer fragile), gently shake them in a bag with the cinnamon-sugar. If you've made muffins, sprinkle their tops heavily with cinnamon-sugar. We've baked these doughnuts cutting the sugar back to just 1 cup; and while they were slightly less tender, we found them just as delicious. Don't wrap leftover doughnuts tightly in plastic; they'll become soggy. If you're not going to consume all of the doughnuts at one sitting, add the final coating of cinnamon-sugar only to those you'll eat; store the rest, without their sugar, on a plate covered with a cake cover; or in a plastic bag that's not fastened shut. Add cinnamon-sugar coating just before serving. Can you make this batter into doughnut holes? Yes! Portion the batter into a lightly greased mini muffin pan or doughnut hole pan, filling the wells about 3/4 full; a teaspoon cookie scoop works well here. 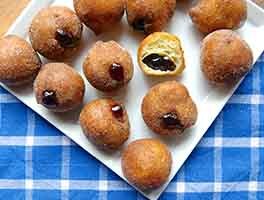 Bake in a preheated 425°F oven for 7 to 8 minutes, or until a toothpick inserted into the center of one of the doughnut holes comes out clean, or with a few moist crumbs. Remove from the oven, let the holes cool in the pan for about 5 minutes, then toss them in cinnamon-sugar. Repeat with the remaining batter. Yield: about 5 1/2 dozen doughnut holes. The recipie tastes great (i used 1 1/4 cups sugar). However, the texture of the outside was very smooth and chewy. The inside was cakey, but not the outside. Any ideas on why this would happen? The cinnamon sugar would not stick. Still tasted great and would make again! 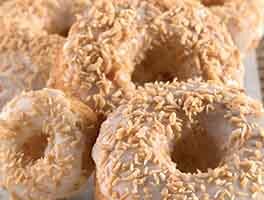 I've tried other baked donut recipes and this is by far my favorite. It actually tastes like a cake donut! The others were definitely missing being deep-fried, heh. 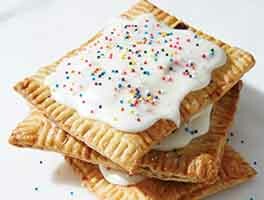 These are quick and easy to make, apparently fool-proof, and my whole family loves them. My only recipe note would be that it makes a bit more batter than 12 donuts' worth, even filling the tins quite full (but that might be due to the specific type of tins I'm using). I subbed 1 cup of coconut sugar and 1/2 cup coconut oil, we loved them! Thank you! 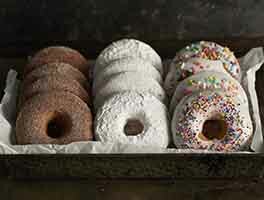 These donuts are terrible--way too sweet (even cutting back the sugar to 1 cup). They taste nothing like a cake donut should taste. Total waste of ingredients. Wonderful recipe. I would like to know if the batter can be made the night before and placed in the refrigerator and used the next morning to bake. Very good recipe. I like that it has a lot of pumpkin. Either as a doughnut or little muffins I love the texture. Once they are cool the cinnamon sugar wont stick. But they are delicious anyway. Very easy to prepare. I would definitely make again as it was what I was looking for. My friends loved it. Of the pumpkin muffin recipes I've tried this is a favorite. Lots of Pumpkin. I left out the sugar and used maple syrup with very good results. This recipe was a hit with my picky family. I love King Arthur brand flours. I won't buy any other brand for baking. Thanks for the recipe! Easy to follow and delicious. I made these as muffins and used my own cinnamon sugar topping and it worked well. I did put the cinnamon sugar on all of them right away (it said not to) so it did get a little soggy but it didn't affect taste at all!